Santa Claus is coming to town... And he’s bringing multiplied prizes, FREE spins and mouthwatering wins! 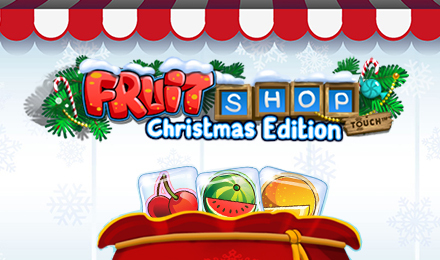 Login and play Fruit Shop Christmas Edition Slots today! Ho Ho Ho! Whether you’ve been naughty or nice, get ready for some deliciously festive wins when you play Fruit Shop Christmas Edition Slots! You’ll be granted FREE spins with every winning line, and when the game’s Wild appears in a winning combination, your prize will be DOUBLED! This delicious online slot game also has a 96.7% RTP and loads of holiday cheer! Login and play now! Good luck!